Moline Builders is not just an Energy Star Builder ... we are a "Certified" Energy Star Builder. This means that Moline Builders has been designated as an Energy Star Partner who has committed to building 100% of our homes to Energy Star Version 3 standards. By using less energy for heating, cooling, and water heating, ENERGY STAR certified homes deliver approximately 20% savings on annual utility bills. Over the 7 to 8 years that a typical family lives in a home, you can save thousands of dollars in maintenance cost. In ENERGY STAR certified homes, comfort is ensured with consistent temperatures between and across rooms; indoor air quality is enhanced by reducing dust, pollen, bugs, and excessive humidity; and durability is improved with comprehensive water protection, windows that block damaging sunlight, and better grade equipment. The energy used in our homes often comes from the burning of fossil fuels at power plants. So, by using less energy to operate, ENERGY STAR certified homes help to prevent air pollution—an added benefit for today's environmentally-conscious consumer looking for "green" choices. When you purchase a Moline built home you don't have to guess at the energy efficiency of your home because each home is tested per Energy Star specifications and given a Home Energy Rating System score (HERS). 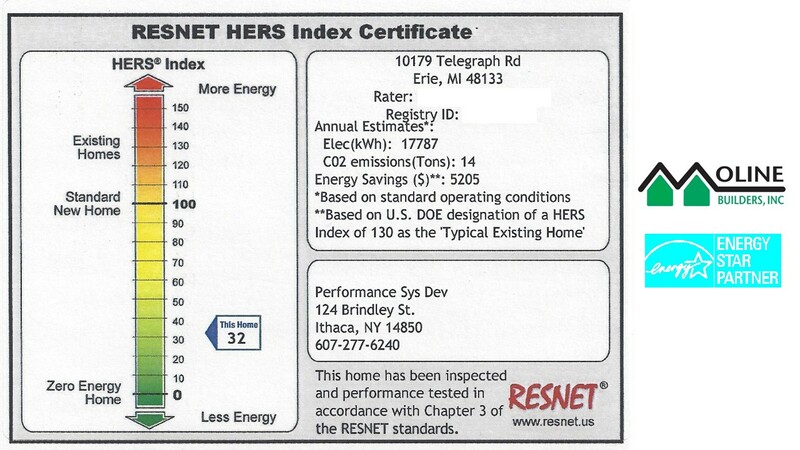 The lower the HERS score, the more energy efficient the home is. Ask prospective builders what HERS score their homes receive?